We love popcorn...all different types of popcorn and we love various seasonings to go along with them. We rarely purchase store-bought popcorn and typically making our own at home. Today, we got a great guest post recipe for all of you who love homemade caramel popcorn! Check it out below. Looking for a light way to liven up your summer recipes? MELT Organic’s all-natural butter substitutes help maintain your healthy lifestyle without sacrificing taste. Made with fair trade virgin coconut oil and other dairy-free, plant-based ingredients, MELT products were created for butter enthusiasts seeking a nutritious alternative. The line is certified USDA organic, Non-GMO Project Verified and free of trans fat, gluten, dairy and soy. 1. Preheat oven to 250°. Coat a large jelly roll pan with cooking spray. 2. Combine the sugars, water, MELT® and molasses in a medium saucepan. Boil over medium heat. Once boiling, cook for 5 minutes, stirring once. Remove from heat. 3. Add the vanilla, baking soda and salt, stirring to mix. 4. Pour the mixture over the popcorn and stir to coat. 5. 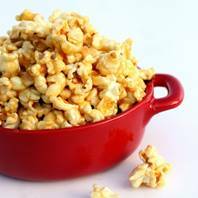 Spread the popcorn in a single layer in your jelly roll pan and bake for 45 minutes, turning the popcorn every 15 minutes so it does not burn. 6. Remove from the oven and break up clumps. Let cool 15 minutes and enjoy! I like this recipe , but I won't be making it until the weather cools down since I don't want the oven for almost an hour. It should taste very good.